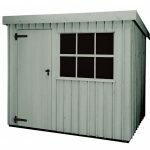 This high quality Shiplap tongue and groove clad pent shed is an excellent addition to the Shed-Plus range. Dip treated for longevity, the design of this building is impressive and offers a stylish, modern look to the garden. One of the first things you will notice is that the door of the shed has a contrasting design to the rest of the building. Whilst the cladding on the external walls runs horizontally, on the door it runs vertically. This isn’t unusual, though on the overlap buildings it isn’t as noticeable. Each and every plank on this shed is defined. It features a single, hinged door and there is a pad bolt installed. This will stop it from opening in strong winds. However, you will need to buy a padlock if you want to secure the building. It also comes with a large styrene glazed window. This adds both cosmetic appeal to the shed, as well as ensuring the interior has plenty of natural lighting. The pent roof is a notable feature as it provides great water drainage, whilst also enabling you to erect the shed underneath obstacles such as low hanging trees. 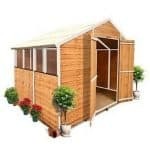 Considering the fantastic quality of this shed, it is sold at an affordable cost. It has been dip treated and comes with a brilliant 10 year anti-rot guarantee. Solid sheet floor isn’t quite up to the same quality as the external cladding and will not support heavyweight storage. However, the joists have been pressure treated for extra strength. This is a superior quality storage shed benefitting from a very compact size. 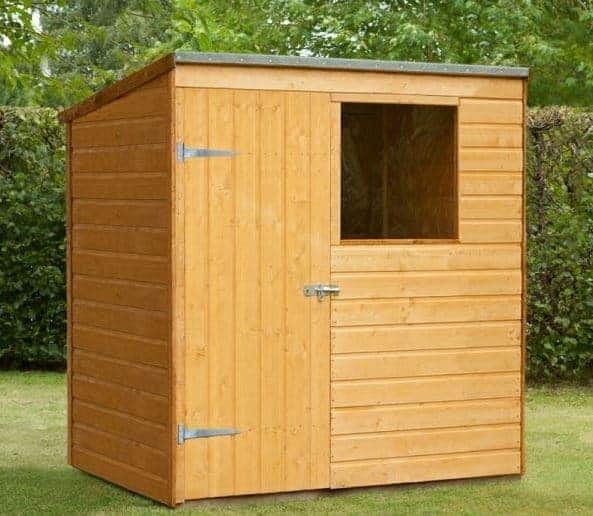 Suitable for small levels of garden storage, this pent shed is great for those who need a space-saving storage unit. Its design makes it suitable for installation in areas where apex sheds won’t fit such as under low-hanging branches or in front of summer houses and other buildings. 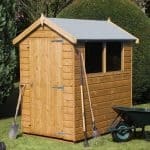 It is part of the Shed-Plus range, known for exceptional quality. As the pent roof slopes downwards, the rear of the building is typically shorter than the front. It is this which makes it suitable for assembly in front of other buildings or fences. What it also means is the level of interior storage decreases in height towards the back of the shed. The door has a standard width, though a slightly taller measurement at 5’7”. You’ll find a lot of doors on similar size buildings measure 5’6”. So it’s not a massive difference, but it can still make it easier to transport tall tools and equipment. Solid sheet materials are used on both the floor and the roof. Whilst the roof only measures 8mm thick, it still ensures a reliable, long lasting design. It also comes with durable roofing felt, though in our opinion it might be worth buying and installing a better quality felt. Mineral felt is known to break down over time and this particular type provided is very thin. So if you want to ensure the roof is protected for a long time to come, it would be worth spending a little extra upgrading the felt. As for the roof’s actual design, the pent style really helps to provide good water drainage. It directs the flow of rainwater down the rear of the building. As mentioned earlier, it also slopes down towards the rear, making it easier to erect the shed in front of garden fences, under low hanging trees and in front of other buildings. The floor measures 10mm thick which is pretty standard when you compare it to other buildings. However, considering the exterior of this shed is made from higher quality Shiplap tongue and groove, we would have liked to have seen the same quality featured on the floor. What it means is that not only do you get a slightly ‘cheaper’ look, but you also don’t get as much strength to store heavy equipment. There is one good thing about the floor however and that is the fact the joists have been pressure treated. This isn’t something you typically find with solid sheet floors so it does make this slightly better quality than others on the market. This stylish shed has been constructed with Shiplap tongue and groove cladding. This is the best quality cladding in the industry and it comes with some pretty fantastic benefits. As you can see from the photo, the exterior walls have a flawless, tight locked design. This is thanks to the interlocking tongue and groove construction. It provides the most substantial level of resistance against the elements and therefore creates a naturally long lasting structure. There are a couple of important features with Shiplap tongue and groove cladding. The first is the channel that is indented into each panel. This works as a barrier for rainwater. If rain gets onto the timber, it is channelled away from the building and doesn’t get a chance to build up and soak into the wood. Secondly there’s an expansion gap which accommodates any shrinkage or swelling in the timber that could be caused because of moisture or temperature changes. This protects its overall stability. Like most sheds, this one comes with interior 28mm x 28mm framing. It’s a standard frame which offers excellent support, even for the stronger Shiplap cladding. The panels of the shed have been dip treated prior to shipment. This is a great feature offered by the Shed Store and it ensures no damage will occur while the shed is being delivered. However, it also provides enough protection for the first year of the shed’s life. So you do not need to apply another treatment after assembly if you don’t want to. However, if you don’t then we absolutely advise you to treat it at least a year afterwards. The dip treatment only protects the surface of the wood so it doesn’t offer the highest level of water resistance. As mentioned, Shiplap cladding is incredibly durable thanks to its unique design. However, like all cladding types, when it does come time to treat the building, we’d recommend using a spirit treatment. This offers an extra layer of protection against the elements, working deep inside the timber, as well as supplying an outside barrier. It will also eliminate the need to reapply the treatments on an annual basis. You could instead treat the shed every other year. A 10 year warranty against decay and rot is provided, though you will need to ensure you maintain the treatments to benefit from this guarantee. A single, strong door is provided and it comes in a standard width. Offering good access into the building, the door has the same high quality tongue and groove cladding as the walls. This means it is guaranteed to stay sturdy for years to come. It features a strong hinged design and is fitted with a pad bolt. So when not in use, you can be sure the door will stay firmly closed no matter how harsh the weather becomes. A fixed styrene glazing window is also added to provide natural light into the shed. The styrene measures 1.5mm thick which is actually a little thinner than it is on some competitor sheds. It still provides a tough, shatterproof construction, but it won’t be as durable as it could be. Like so many of the sheds in the Shed Store range, this building doesn’t have the best security. The walls are generously thick so they do provide some protection as they will prove very difficult to break through. However, you will need to buy a padlock separately to ensure your storage is kept fully secure. A high quality padlock can easily be installed onto the pad bolt already attached to the door. Privacy is also pretty limited due to the fixed styrene glazed window. However, unlike a lot of sheds available from the manufacturer, this one comes with the benefits of Shiplap cladding. One of these benefits is the fact you can attach things to the interior walls. So you could add a blind or curtains behind the window to improve its privacy, whilst still benefitting from natural lighting when you’re using the shed. You can customise the shed with coloured treatments. Shed Store provide two different water based treatments in Harvest Gold and Dark Brown. Whilst the building doesn’t need to be treated after construction, these water treatments are a great way to add colour and provide even further protection against the elements. They are quick drying and if you spill them, they are also easy to clean. At such an affordable cost it is definitely worth considering these 5L treatment tubs. If you’re hoping to improve the security of the shed, the Shed Store also have two options available. The Security Alarm Padlock is recommended and it comes equipped with 3 keys. So if you lose one, you won’t need to worry as you’ll have another two left over. What’s great about this padlock is that it comes with an alarm which will set off if anybody tries to get into the shed without a key. This alarm continues to sound until no movement or vibrations are detected. It’s one of the most secure and effective padlocks on the market. However, there’s another even more impressive option available and that’s the Yale Security Kit. This contains a padlock, hasp and alarm. It is only a little more expensive than the single padlock available and it comes with a year’s warranty. 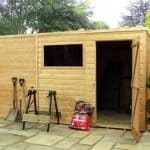 If you aren’t already aware, it is vital that you build the shed on a very flat, solid base. Concrete or paving slabs are preferred, but if this isn’t possible the Shed Store offer a high quality, long lasting wooden base. It is one of the more expensive extras but it is an extremely good quality base to invest in. It even features a 10 year guarantee and comes with spikes which anchor the base into the floor. 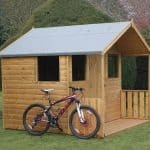 It can be used immediately after assembly and also makes the installation of the shed a lot quicker as well as easier. Therefore it is a very useful extra to buy. The final extra worth mentioning is the solar light. Now the shed does come with a window so during the day you will have an adequate amount of light to see inside the shed. However, at night or on dark days you may have trouble. That’s where the Solar Light comes in. It contains batteries which charge during the day via a remote solar panel. Powered by the sun, there are absolutely no running costs involved and it is also kinder to the environment too. It comes at such a low cost and every light is fitted with 6 unique LED bulbs. It provides a great amount of light when you need it. As it doesn’t need to be wired to the mains, installing it is extremely simple. The overall quality of the shed is brilliant. The only things that slightly let it down is the low quality roofing felt and the solid sheet roof and floor. The shed does need treating, but the good quality cladding means it doesn’t require as many treatments as an overlap shed. So its natural longevity is pretty good. We do advise upgrading the roofing felt to ensure you are getting a long-lasting roof however. 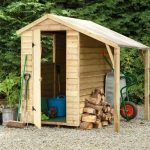 Being a small shed, it doesn’t offer an outstanding amount of space, but it can still store light-medium weight gardening essentials such as a plastic wheelbarrow, rakes, shovels and other gardening bits and bobs. The thick clad walls also provide extra storage potential as you can easily install shelving if required. Installation is very easy thanks to the detailed, simple instructions included and the compact size of the building. It shouldn’t take more than a few hours to put together. This is a very good value shed considering its exterior walls are made from Shiplap tongue and groove. Whilst it does require a few extras such as a padlock, it still comes at a very good price. Final Thoughts: This is an excellent value high quality storage shed with a range of great features. The Shiplap tongue and groove cladding has been dip treated prior to shipping, reducing the amount of treatments required. A styrene glazed window provides light into the shed, while the high quality single door offers easy access into the building. We like its contemporary, stylish design and great space-saving pent roof. It’s a compact shed that will fit in even the smallest of gardens. Investing in a good quality padlock will help to secure your storage and ensure your tools and equipment are safe all year round.